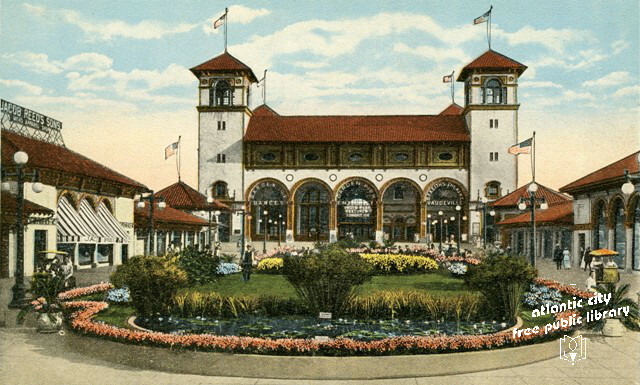 Did you know that July 19, 2013, marks 100 years since Garden Pier first opened? Garden Pier stood apart from the other piers in Atlantic City. First opening on July 19, 1913, its "uptown" location placed it away from the frenzied activity of the bustling downtown. The red-tiled roofs and Ionic architecture style of the buildings and the beautifully landscaped gardens gave the pier a formal appearance which attracted an upscale crowd. The centerpiece of Garden Pier was the stately B.F. Keith's Theatre, which for many years rivaled any of those on Broadway. Here, Tobacco Road and George White's Scandals premiered; during one notable week, both Douglas Fairbanks and Sophie Tucker appeared. One of the city's largest ballrooms was on the pier. In it, dances were held and large conventions met before the Atlantic City Auditorium was built. The first Miss America pageant started on Garden Pier in 1921. For many seasons, businesses such as Underwood Typewriter, Hoover, and Pennsylvania Rubber Company advertised their wares to passersby. Taking advantage of the opportunity to attract people leisurely strolling by, the companies showcased typewriters, vacuum cleaners, car tires, and more. Ultimately, the uptown location made it less commercially successful. After languishing for a decade, the pier was purchased by the City of Atlantic City in 1944. It survived the Great Hurricane of 1944 with extensive damage, but a new era for Garden Pier began when it reopened during Atlantic City's Centennial celebrations in 1954 as the Garden Pier Civic Center. The pier housed the Atlantic City Art Center, a historical exhibition, a fountain, and a concert and band shell. Florence Valore Miller, a charter member of the Atlantic City Art Center, became the Civic Center executive director in 1962. For years, songstress Lucille "Aunt Lucy" Russo gave local youngsters their first taste of stardom in Garden Pier's Civic Center with her Boardwalk Star Revue. A devastating fire heavily damaged the pier in 1981, but thanks to the dedication of Mrs. Miller and Atlantic City Councilman Walter Collette, the pier was rebuilt. In 1985 the Atlantic City Historical Museum joined the Art Center on the Garden Pier. The pier underwent major renovations in 1994, funded by the City of Atlantic City, and again in 2012 with funding from the City, the Casino Reinvestment Development Authority and the pier's new neighbor, Revel Hotel Casino. Today, the Garden Pier is the only municipally-owned pier in Atlantic City. The Atlantic City Art Center, under the management of the City of Atlantic City, and the Atlantic City Historical Museum, under the management of the Atlantic City Free Public Library, join in wishing the Garden Pier a very happy 100th anniversary! Please visit the Atlantic City Historical Museum when we reopen to see the exhibit "Atlantic City Experience: 100 Years of the Garden Pier." 1917. Postcard showing the buildings and gardens on Garden Pier soon after it opened. The large building in the center was B.F. Keith's Theatre. H049.624.158Gar014, Atlantic City Heritage Collections, Atlantic City Free Public Library. 1930. 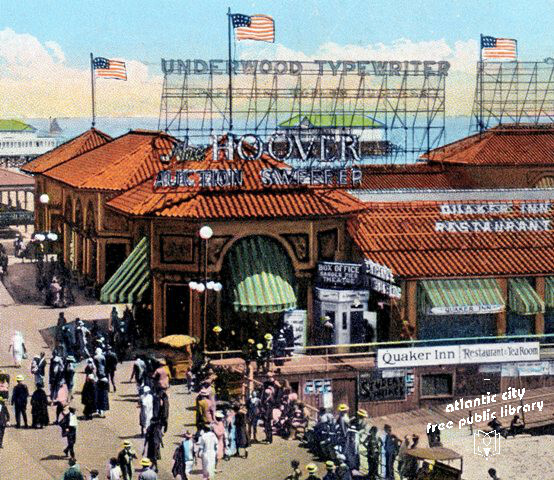 Postcard showing the entrance to Garden Pier with signs for Underwood Typewriter, Hoover, and Quaker Inn Restuarant, as well as the Theatre Box Office. H049.917.4985Boa041, Atlantic City Heritage Collections, Atlantic City Free Public Library. November 2012. 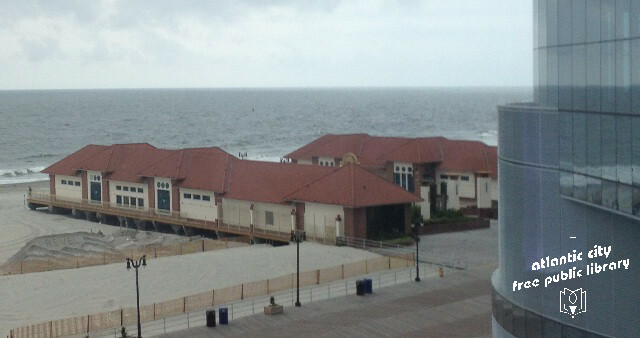 This photograph of the Garden Pier was taken soon after Superstorm Sandy from Revel Hotel Casino. H001.Picture007, Atlantic City Heritage Collections, Atlantic City Free Public Library.